Virginia native and prominent civil rights lawyer Frankie Muse Freeman died this past Friday, January 12. Freeman was born in 1916 in then-segregated Danville, Virginia and went on to graduate from Howard University School of Law in 1947. She founded her own law firm in 1948 and was legal counsel for the NAACP when it filed the landmark discrimination cases against the St. Louis Board of Education and the St. Louis Housing Authority. In 1964, she became the first woman of color appointed to the U.S. Commission on Civil Rights. Freeman worked as general counsel of the St. Louis Housing Authority and as Inspector General for the Community Services Administration during Jimmy Carter's presidential administration in 1979. She was still practicing law in St. Louis until the age of 90. In 2007, Freeman was inducted into the International Civil Rights Walk of Fame at the Martin Luther King Jr. National Historic Site in Atlanta, Georgia. In her volunteer efforts, Freeman was active in the leadership of Howard University, the United Way, the Girl Scouts, and the Delta Sigma Theta Sorority. Last year, the VSB created the Frankie Muse Freeman Award in her name to honor those organizations that make outstanding contributions to pro bono services for the poor. The inaugural award was won by McGuireWoods. 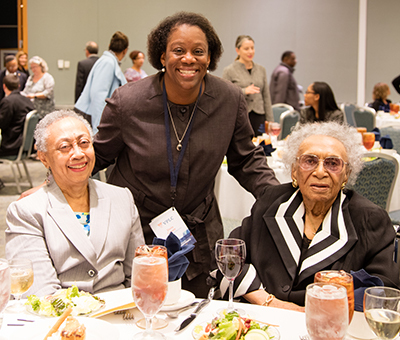 Caption: Civil rights icon Frankie Muse Freeman (right) with VSB President Doris Henderson Causey (center) and Freeman’s daughter Shelbe Freeman Bullock (left) at the 2016 VSB Pro Bono Conference.